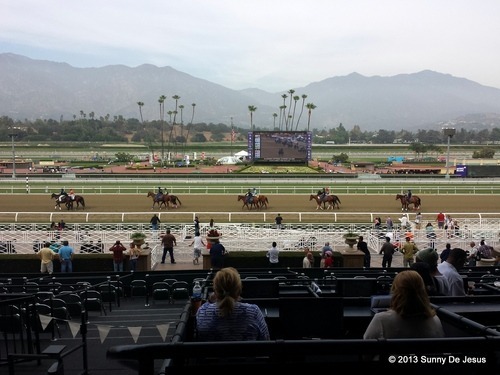 Yeah, Santa Anita Park is no longer the place for horse racing fanatics to spend their earnings time; it’s a newly renovated Los Angeles area destination for EVERYONE including Hipsters and Foodies to spend the day at the horse races. 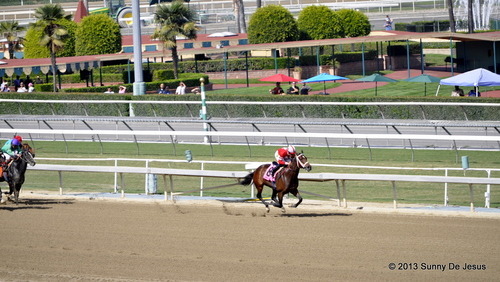 Just the other day, I got the invite to check out the newly renovated Santa Anita Park a.k.a. the Santa Anita Racetrack. I was actually quite happy to have received the invite, because I really love horse racing and the Santa Anita Park is my go-to place to watch it live. I believe I’ve been to Santa Anita Park four times this year. During the times that I visited, I noticed lots of construction. So here’s the scoop, this 1930s vintage racetrack has morphed into a high tech facility thanks to the $50 million dollar Santa Anita Park renovation project. The investment provided a much needed facelift throughout the park. Along with the changes to the exterior and to the interior, there was major and I mean, major upgrade to the dining areas and food concessions. Finally! So before I start taking about the food, which happens to be my favorite subject, let me show you some photos of the newly remodeled Santa Anita Park. 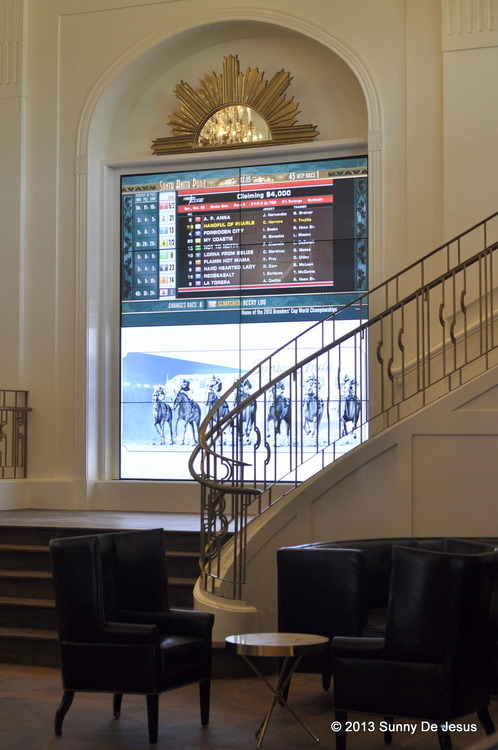 The Club House Mezzanine and portions of stadium are now fitted with plenty of LCD monitors to keep everyone well informed with the horse races at Santa Anita Park and racetracks throughout the United States. There is free WIFI available for those of you who like to catch up with work, scroll through your iPad or tablets, or keep up with your social networking via your smart phones. All the Box Seats got a makeover too including portions of the General Admissions Seating. From my understanding the renovations are not entirely completed as they still have a lot more changes planned. 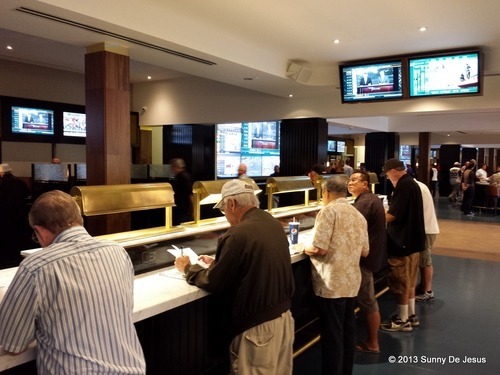 A new additions to The Santa Anita Park are two the really cool, yet private VIP areas on the 2nd floor of the Club House for high-end wagering. 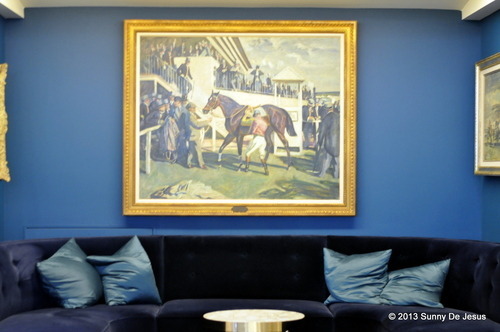 Imagine networking with your business colleagues in this room while looking at vintage photography and modern art that showcases parts of the racetrack;s history. Remember the Club House Chandelier Room with the kitchy Kentucy Derby decor? Well, it’s now a modernize 1930s art deco lounge area with several jumbo LCD screens to keep up with the stats and the live horse races outside. 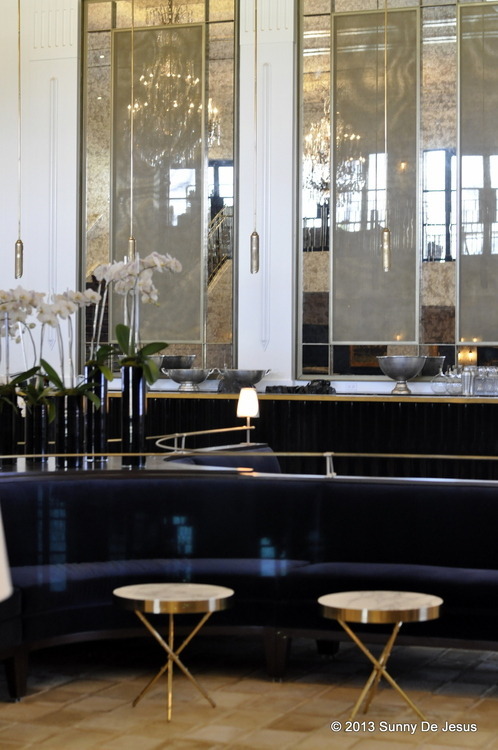 I especially love the bar area with the 21st century look of a 1930s art deco design. In this space, they have opened up the walls and added plenty of windows for natural lighting. Those big mirrored walls behind the bar helps illuminate the natural light in this room. I don’t know about you, but I can imagine myself having a dirty martini at the bar. Upstairs from the Chandelier Room is a private VIP sports lounge and bar area for those corporate parties or special occasions. The bar area counters are made of natural wood as are the floors. 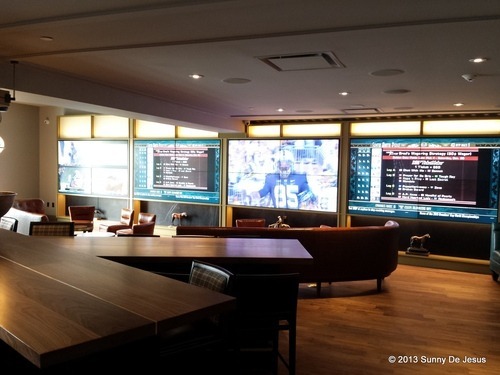 Two walls in this space are lined with jumbo LCD screens to watch every single sports imaginable including the horse races. There is also a private balcony. 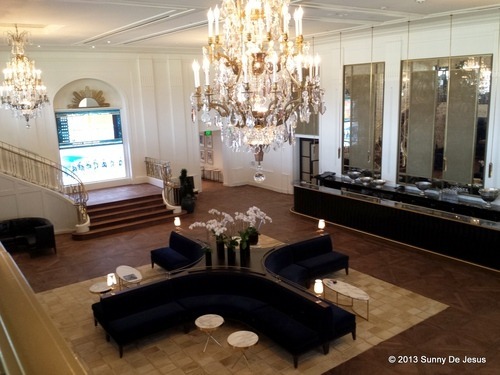 Okay, now on to my favorite topic…the dining areas and the food concessions…..
On a few occasions prior to the renovations, my womens group and I spent a day at the races for a networking lunch. I remember the food being quite good and the service was meticulously impeccable. 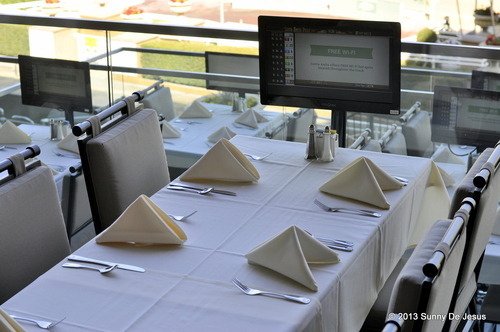 back then, we dined inside an enclosed dining area behind a window that over looks the race track. 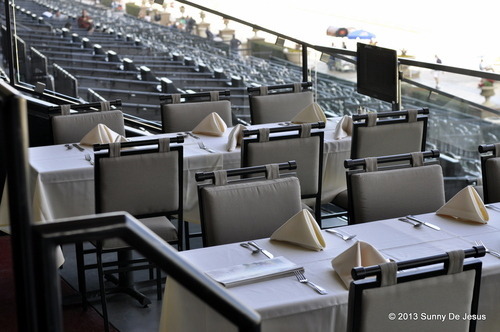 Well, I was thrilled to discover that the Santa Anita Park renovations has expanded Club House Terrace Dining area. I love the outdoor tiered dining spaces. I also love the taupe colored table cloths and chairs. What also impresses me are the LCD monitors at each dining table. It’s nice to able to watch the horses being warmed up via the TV or hook up your laptop to it to show slideshow photos of your family and friends while you’re eating. The Food Concessions at the Club House Mezzanine: The long over due upgrade to the food and drink selections at the Food Concessions is blessing. 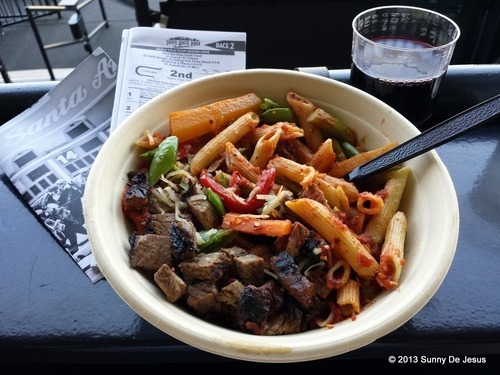 I found that the Santa Anita Park now has food and drinks that attracts the Hipsters, meets the needs of health conscious eaters, and tantalizes the taste buds of Foodies. 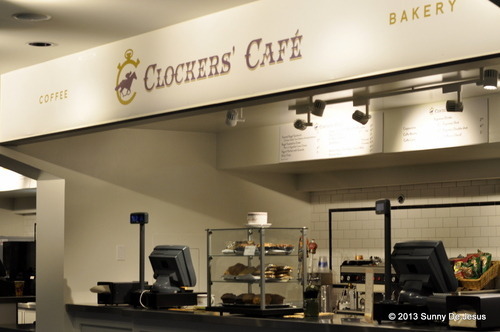 Clockers Cafe that serves coffee, bakery treats, and breakfast for patrons who arrive for the early morning posts. Press Box offers fresh squeezed fruit juices and smoothies. The Turf Course is a build your own salad bar with lots of fresh vegetable items to choose from. The Pick 3 Noodle Bar is a favorite of mine; a build your own noodle bar. So what you do is select your choice of pasta noodles or udon noodles. Next, you select your choice of sauce (marinara, white wine sauce, or sweet & spicy ponzu). Add a meat of your choice like grilled chicken breast, sauteed shrimp, or roasted tri-tip steak. 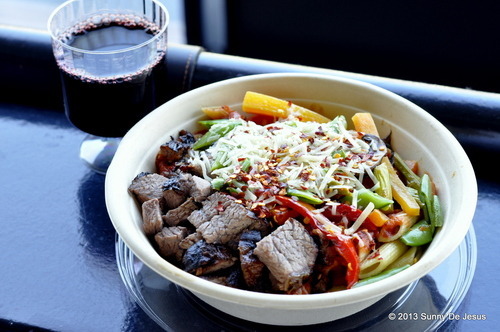 Then, you can add all the seasonal fresh veggies and/or garnishes to your bowl. Note that hearty bowl can actually feed two people. Grade One is another favorite of mine. It’san Artisan Sandwich Shop for those who want really great tasting sandwich. During the walking tour, I could not help but smell the wonderful aromas of the corned beef throughout the mezzanine. At the end of the tour, I grabbed a corned beef sandwich. It is a monster sized sandwich with those nice fresh pickles that rounded the flavors. The hand carved sandwiches are piled high on white bread with your choice of fresh roasted turkey, juicy corned beef, or succulent prime rib. Farriersis the destination to find Craft Beers and Wines. If you’re not into the fancy stuff, you can still grab your favorite draft beers and basic cocktails. I admit that I’m not much of a beer fan, but I do love my wine. 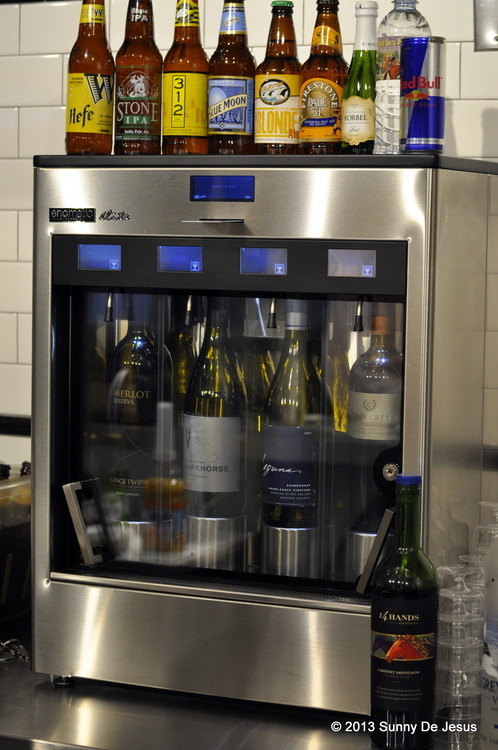 Of all places, I loved finding an Enomatic Wine Dispenser at a concession stand. For me, it meant drinking the best quality wine, because it’s being preserved at all times without over oxygenating the wine. By the way, my glass of a 2009 Lange Twins Merlot was fantastic. After a long day at the Santa Anita Park, I must say that I am thrilled to have toured and seen all the new changes throughout the park. 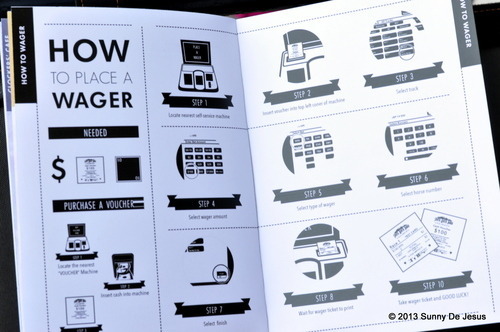 As I have already mentioned, I especially like the upgrades to the food and drink selections and the dining areas. It’s hard to believe that what I have seen so far has only been six months of remodel. They have done a lot of impressive upgrades and makeovers in just a short amount of time and, from what I gathered, the renovations are still ongoing. Anyway I like all the changes to the Santa Anita Park. It’s modern, it’s inviting, it’s also 21st century high tech. The food and drinks are phenomenal as there are plenty of healthy fresh food and artisan choices now. Well done, Santa Anita Park. Well done.